OK cycling season in the high (and medium) Alps is winding down for 2007. I awoke this morning to snow in Zermatt, the beautiful car-free swiss ski village below the Matterhorn - and had a terrible time renting a bike. OK cycling season in the high (and medium) Alps is winding down for 2007. I awoke this morning to snow in Zermatt, the beautiful car-free swiss ski village below the Matterhorn – and had a terrible time renting a bike. Bike guy: No, there is too much snow up high. Me: Great! Look I will pay you extra – please may I have a bike? I tried two places and the local authorities had clearly given instructions not to rent bikes to dumb tourists during blizzards. 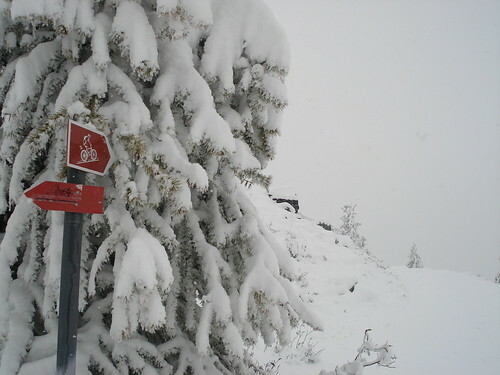 Below: I later find the well signed biked route under a foot of snow (about 1,500 feet above Zermatt). Damned if I was going to sit around town so I decided to hike the highest mountain bike route – my goal was the top of a long cable car at about 2600 metres – right below the Matterhorn – stunning. 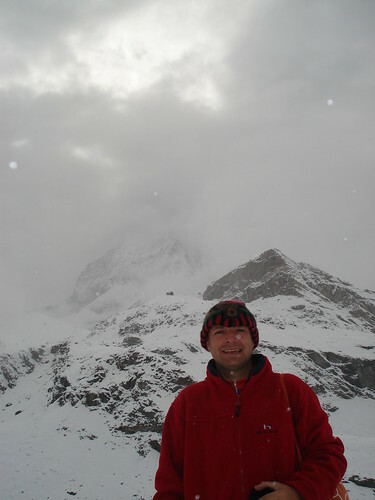 Zermatt is at 1600 metres (+5000 feet) and I know the roads up high fairly well – so I set off happily and swiftly. 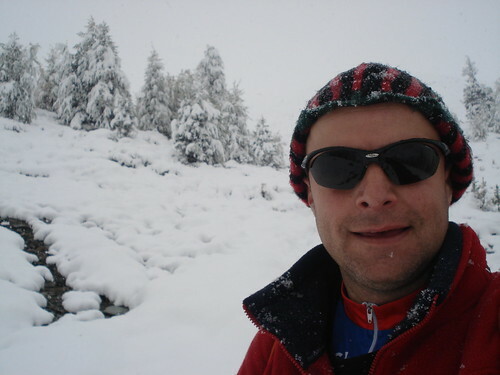 At about 1800 metres the snow started getting heavy and I could finally admit that the bike guy had a point. The tourists were hibernating and I was trail blazing, but really enjoying the special silence that comes with windless snow and low clouds. At 2000 metres it started getting deeper. At 2200 metres, the trail left the big path and became hard to follow in deep snow as it started winding up to the Matterhorn, . Below: Completely lost but cheerful. 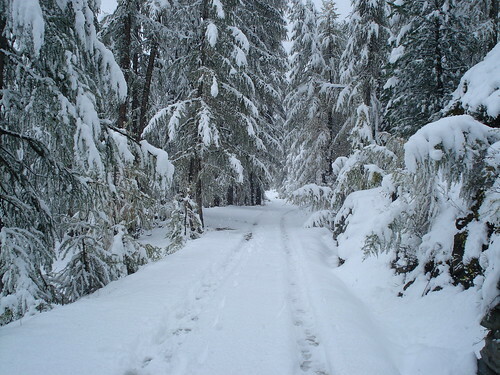 At 2300 metres – in heavy snow, I realized I had no clue where the trail was and I was clambering up a steep hill with the snow knee high. Sadly, prudence being the better part of valour, I backtracked. Still a terrific hike. After descending and meeting my mom for lunch, we took the cable car up to my hike target and just about saw the Matterhorn (left side – use your imagination. 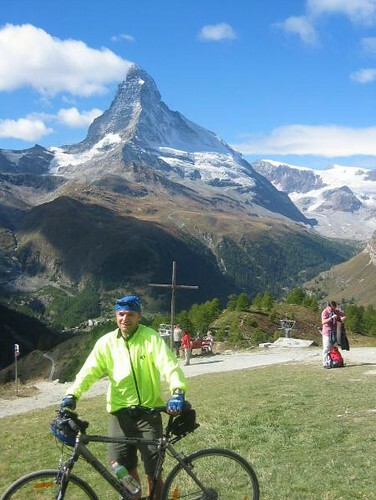 Below, cycling near Matterhorn a few years back (with the sun). Awesome. We plan on going in April 2015 enroute to The Giro D’Italia.